Webster’s first definition of pride is an overly high opinion of one’s self and exaggerated self-esteem and conceit. A common cause of anger is loss of personal pride that results when self-esteem takes a hit due to an injustice (either real or perceived) that causes guilt, humiliation and shame. These four emotions—guilt, shame, anger and pride— are all from the same dysfunctional family. And they can smack of narcissistic behavior and the defenses of the ego. If you want to have fewer narcissistic traits, study your ego defenses and pride and how you need to feel superior for your abilities. 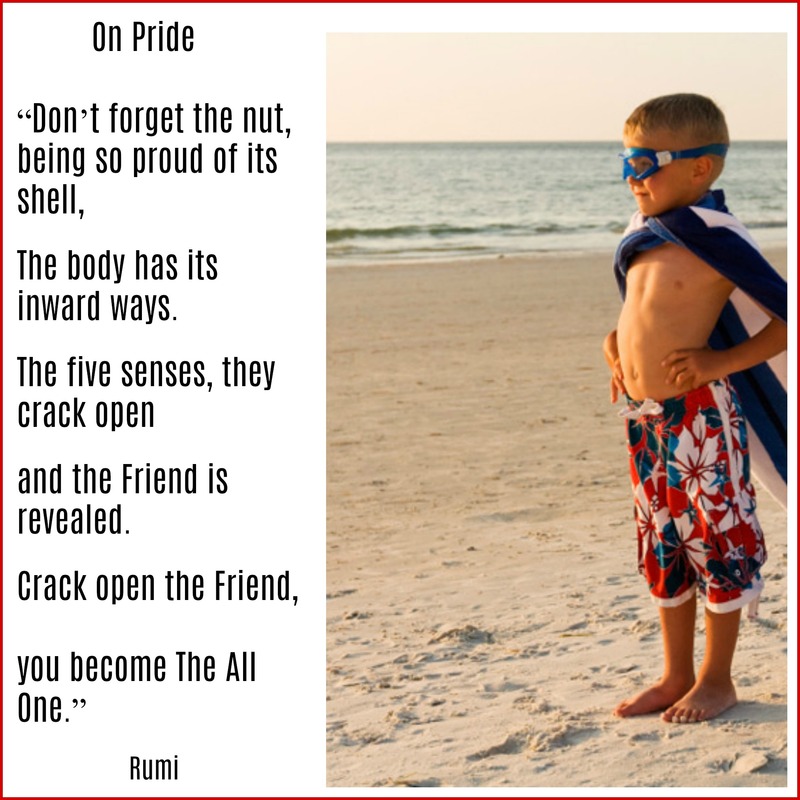 I discuss how to help children develop a healthy pride for work well done in my bully prevention book, Bullies Need Help Too! 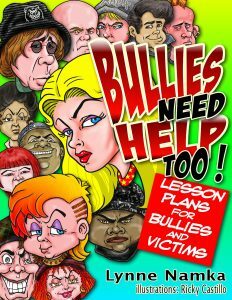 This book is a lesson plan for bullies and victims and can now be purchased in multiple formats. The fields of psychology and spirituality have different definitions and understandings of ego. The ego as defined by Western psychology is that central organizing principle that is necessary for ongoing life. It takes in information from the senses of sight, hearing, and touch. Something has to figure out the day, organize tasks and assign meaning to experiences and that is the task of the ego as viewed by psychology. According to the psychology field, we need a strong enough ego to deal with everything that needs to be accomplished to survive. Jack Engler says we need to have a healthy enough ego to face the world before entering the path to transcend the ego saying, “You have to be somebody before you are nobody.” The psychological journey is to help the person with the process of self-development and get it together. Most forms of psychotherapies are designed to strengthen and heal the wounded ego, not transcend it. The unhealthy defense mechanisms of the ego are another matter altogether. These personality defenses are those thoughts, beliefs, desires and behaviors that are born out of trauma and the wish to survive. Survival is always an uncertainly and the ego fighting for its own existence has its own tools and tricks. Many of them operate at an unconscious level so we don’t recognize them as such. The defense mechanisms are how we learned to do things and continue to do so out of habit. Defenses pop up when our emotional or physical safety is threatened and when we think we can’t trust others to give us what we want in that moment. The psychological defenses are reactions to our strong attachment to a belief of how things must be—our “shoulds” scream out insisting things be as we want to feel safe. Unexamined defenses are usually arrested at the age of the little child who experienced an early trauma. Trauma freezes the energy in the past. Those rationalizations, justifications, denials and defensiveness come out when we feel the same emotions of helplessness, anger, fear and hurt experienced in childhood. As adults, acting like we did when we were two or ten or whatever age creates havoc in relationships. Events which are similar to the earlier trauma can take us out of the present into the past, seeing and reacting like the survival mode of the little child. The limbic system is activated to prepare the person for fight or flight. With trauma early in life, there is the loss of authenticity and the inability to be present in the moment. The ego, in most spiritual circles, is defined as that which attaches to the false nature of who we are. It obscures or veils our true nature of being the Divine. It is unaware of its limitations, arrogance, pride and denial. It is part of the lesser self which falsely identifies with the body, opinions, prejudices, worries, judgments, addictions and reputations. It was born of the personal history and suffering and overly attaches to self-image. It feels separate or cut off from the greater whole and must be constantly on the lookout for any threat to its demise. It pursues what it already knows—further separation. It fights for survival against change, against losing control, against the unknown and against the spiritual journey. The egotistical part of the self shouts, “My way! My way of thinking, my way of believing, acting, choosing—my way over the way of others.” When we want/insist/demand that things be the way we want when we try to change the reality of how things are in the moment, the ego is trying to preserve itself. Any time we feel better than or less than others, the ego is operating to make us believe that we are separate. The ego carries false pride and arrogance. It has many other defenses mechanisms that are beguiling and cunning, trying to lure you away from the journey of knowing your true nature because that might threaten its very existence. The ego defenses unhealthy pride, shame and entitlement lie at the core of narcissism. If one end of a continuum is false or unhealthy pride, the other is healthy pride in accomplishment, working hard, treating people well and doing the right thing. False pride which is self-aggrandizing is a distortion of the ego. The fear-based ego which thrives on being prideful pulls out all stops to hold on tightly to something disagreeable. 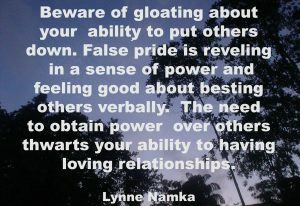 False or unhealthy pride is destructive when you are proud of doing something that hurts others. With false pride, it is pure ego. A person might be proud of being lazy, stubborn or even bullying and hurting others. Feeling proud of being bad or for hurting others is unhealthy pride. Having pride for the wrong thing comes from the fear-based part of the ego. 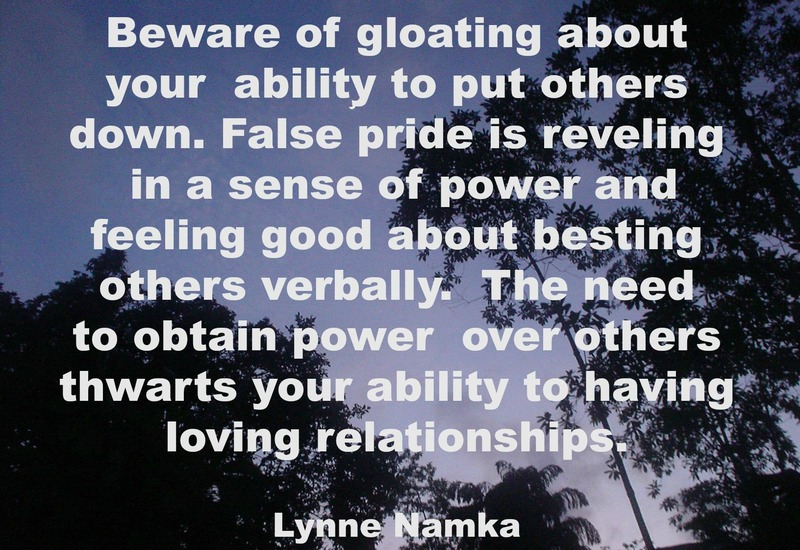 Unhealthy pride is an ego hook. Tyrants and bullies often take perverse pleasure in being tough and mean. False pride keeps a person separate from others. Putting others down appears to give some people a minor boost in feeling good about themselves but is a sign of low self-esteem. Really feeling good about one’s self does not require you to harm others. Bullying others can have a biological basis. The put-downs of vulnerable people can activate the dopamine pathway in the brain thereby giving a slight brain chemical boost. It can give a “dopamine fix” of positive transmitters and feelings of power. Current addiction theory says that people can become hooked on any activity that gives them an increase in the dopamine pathway. Bullying, verbal abuse and getting angry all can fit in this getting hooked on one’s own brain chemicals. Excessive vanity is too much pride around one’s appearance. In this sense, pride is narcissistically connected to being special, actually looking extra good for the wrong reasons to booster the self-esteem. Over emphasizing pride of the superficial, temporal or material aspects of your life can make you a shallow person. Unhealthy pride is part of that Lesser Self within us that is born of insecurities. Some people are more likely to have a type of pride resulting in smugness, conceit and arrogance. They don’t have the capacity to care for others or the finer values that support our living in peace and harmony. 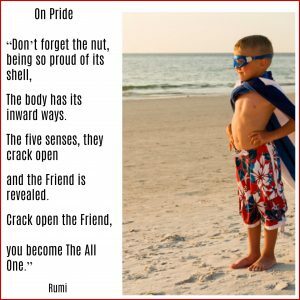 Pride is a normal human emotion and one that is worthy of self study. Healthy pride is about effort, persistence and cultivation of behaviors that make you a better person. It’s feeling good for a sense of achievement. Feeling proud of your children who have done well in an activity and are good, decent human beings is normal healthy pride. Healthy pride supports people and their growth. It is a reward for expending effort and a job well done. We can teach our children to acknowledge the good feelings when they have accomplished something hard. Showing them how to give themselves “Attaboys” or “Attagirls” helps them associate feeling good (proud of themselves for working through something hard). Demonstrating how to pat themselves on the back literally helps cement in healthy pride for effort and persistence when facing a hard task. Part of the spiritual path is looking at the areas in life where you have false pride which is an indicator that there’s some low self-esteem. We seem to need our suffering in this journey of evolving to a higher consciousness perspective. We hold onto undesirable emotions and ideas until a shift in perception shatters the limited thinking which has been held in fear. Misfortune and hardship are needed to give that necessary jolt and vulnerability to see things differently. The needy ego can never be satisfied, but it can be challenged. The distortions of the ego that use pride to view one’s self better than others can be corrected if you learn to recognize them and challenge them when they come up. Self inquiry is a large part of the spiritual process. I look at my own personal brambles of self-doubt, superiority and pride which keep me from moving on through to my better self. Arrogance and pride are part of the ever-separating ego’s insistence on being self-important and self-serving. Lao Tzu’s small text, Tao Te Ching, has been instrumental in my addressing feelings of pride and superiority. Dipping into reading about the Tao can shake me out of what I call my puffed-up-like-a-toad defense of inflating myself. The ego can take me into False Pride to try to lull my doubts and cover up my insecurities. Lao Tzu’s Tao Te Ching, is one go-to book to address your ego again and again. Ernest Hemingway said,“There is nothing noble in being superior to your fellow man; true nobility is being superior to your former self.” So study pride and how it effects your outlook on life. You can work to release any unhealthy idea that comes from the troublesome ego. Start by watching your thoughts of smugness, judgment and pride. Catch yourself in the act of feeling proud and determine if it makes you happy and then give it the fair, just and kind test. Does what you are experiencing feel haughty? Would you admire this attribute if you saw it in others? We can work our thoughts and bring them to a conscious level to assess them and send those less admirable ones packing.